Jenny Braconnier sits at a hulking grey machine, amid the fumes of molten lead, swiftly typing out the news from northeast France on a strange-looking keyboard that produces lines of metal type. Beside her is a smartphone, one of the few nods to modernity in the deliberately retro newsroom of Le Democrate de l'Aisne. Braconnier, 21, and four young colleagues have mastered a 1970s Linotype machine for the weekly newspaper which covers an area near Belgium that proudly sticks with a technology most papers abandoned decades ago. The four-page broadsheet, which bills itself "100 percent lead, zero percent web", covers the local farming scene along with more timely concerns like trends in New Year's greeting cards or the tally of anti-fraud operations carried out in the area last year. "It's a place where we do whatever it takes," said Braconnier, who started three years ago at what she readily admits is "an unusual job". 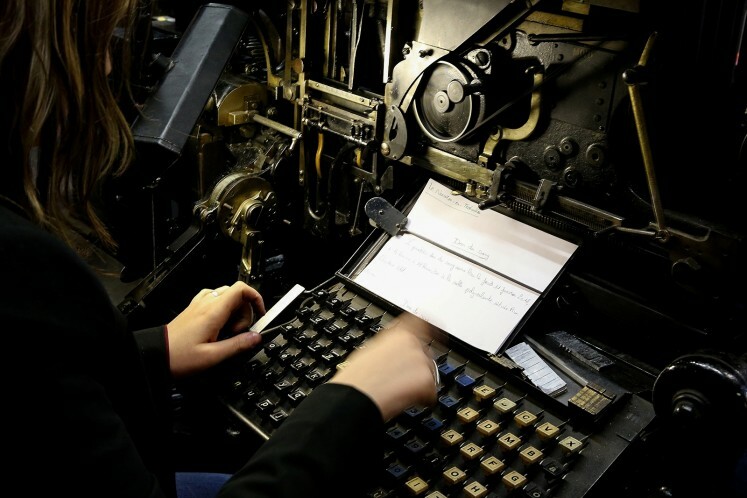 Each strike of the Linotype's keyboard sends a "matrix", part of a mould for forming each character of type, into a cartridge that sets a single line of text. Once it's ready, the molten lead -- in fact an alloy of lead, tin and antimony -- is poured into the moulds, which are then set for printing. It's an exacting process, and not easy to pick up. "There are no more schools, no more courses. 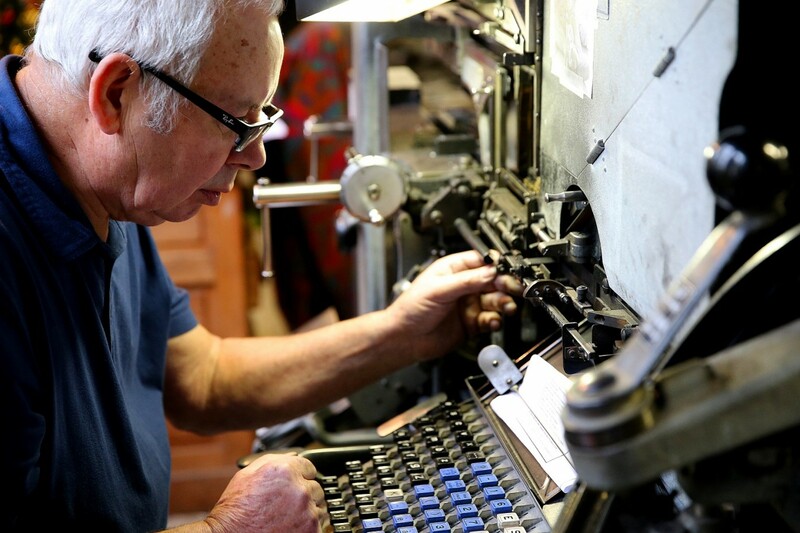 I learned it all in a couple months" before two fellow typesetters retired, Braconnier said. And it isn't not easy to keep a Linotype up and running -- in September the rotary press from 1927 broke down, forcing the paper to resort to digital printing for three months. "The clutch gave up, and so did the drive belt," said Kevin Germain, 26, who originally trained as a car mechanic. The newspaper had to find a foundry to make replacement parts out of steel. The Aisne Democrat was founded in 1906 by Pascal Ceccaldi, a recently arrived Corsican who was elected to parliament representing the town of Vervins. At one point the paper was publishing 20,000 copies a day, employing 20 typesetters who could put out up to six pages. These days circulation stands at some 1,500 copies a week that sell for 60 euro cents ($0.70) each, with the young team backed by former employees as well as the paper's director, Jacques Piraux, 76. "I've got my succession plans in place," says Piraux, who is also president of the Friends of the Democrat, the association which took over the paper in 1987 as it was facing insolvency. He is convinced that "young people can adapt" and keep up the hot-metal-type tradition, which has earned the paper subscribers from as far away as Sydney and Hong Kong. His most recent recruit is Nicolas Laplace, 29, who recently was fishing around for matrices to slot into the cartridges -- in reverse order, as required for the printing process. "It wasn't easy at the beginning," he acknowledged. "It's part of what sets us apart," said Eleonore Dufrenois, a reporter and assistant director. "The other part is the layout itself, the columns, made with the lead -- it's the last in Europe," she said. The Democrat even won a special mention at the "Future of the Press" trade show outside Paris last November. "People buy us because we're different in both content and form," Dufrenois said. "We're unusual". But maintaining its financial balance is a constant battle, even with a solid base of some 1,100 subscribers who pay 26 euros a year. The paper accepts no advertising beyond legal notices -- its main source of revenue -- and refuses the subsidies offered by the French government to newspapers, as a gauge of its independence. Annual revenue stands at around 150,000 euros, and the paper is thinking of setting up a foundation or a museum dedicated to the history of the press. There are no plans, however, to expand onto the internet: the Aisne Democrat appears destined to continue emerging from a workshop heavy with the smell of lead and the clacking of metal on metal. But as it pushes ahead after 112 years, the paper is in the market for a new Linotype.